We are on tract for another solid salmon season on the Cowlitz River and while I consider it a normal run there’s a lot of positive’s to take from what we are experiencing. I’m catching a lot of salmon each day, but I wouldn’t call it leaps and bounds better than anywhere else, like the Columbia is. The Cowlitz is the normal Cowlitz. It’s doing really well. But, the run is lasting longer than it normally does and we continue to maintain a good, strong fishery. The fish I caught today have sea lice on them still. The bite will go into the first week of October, or a little bit longer. Normally, we get 5-8 kings a day. That’s a normal trip. This fall, however, I’ve been getting 12-14 fish a day, occasionally more. And, I’ve had a couple 30 fish days. 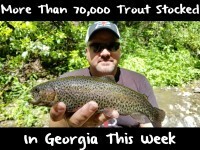 It’s fishing better this year, but I don’t think the run is larger. The fish can’t escape you as easy and because the water is low they cant get through the system as fast, which is working in our favor. The above numbers don’t include jacks. And, now there’s jacks in the system, too. If you count the jacks, too, you are hooking 30-40 fish a day. But the jacks are 16-18 inch silver fish. Some of the holes there’s so many that you catch 3-4 immediately. Water levels are changing the way we fish somewhat. We have a low water year. The water levels are such where the fish are pinned down tighter. They can’t move much because the water level is being kept down low. It’s allowing us to get at them a little easier. The lower than normal flows have changed the holes a little bit. I’m concentrating more on faster, deeper water. Some of the holes haven’t fished the way they have in the past because they are too slow. Whenever you have faster, deep water you’ll have fish. Ironically, people think because of the slower water I’d lighten up my lead, but I’ve gone the other direction and used more lead so I can get down in those holes. 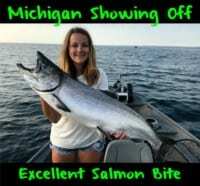 Pencil lead wise I typically use 1 ¾ to 2 inches and right now I’m fishing 2 ¼ to 2 ½.
I’m side drifting with 10-pound Hi Vis Ultra Green Maxima mainline and an eight-pound leader. We use Okuma SST rods with an Okuma RTX reel and Vision No. 2 Octopus hooks. The one thing I do that’s different than most people is use a size 8 Corky. Most use a smaller one. I’m using a mark larger Corky than the average person. I want the floatation because in the Cowlitz you are fishing over St Helens ash. The bottom you are dragging over is sand and ash. I believe the salmon aren’t lying on the bottom, so I use the Corky to float my bait up higher. I want it out of the ash and sand that’s rolling around on the bottom. The other reason I use a larger one is because you are taking about Chinook. Their mouths aren’t very small. As long as you have good bait with a good smell they are going to bite it. I want the bigger offering to entice the fish and make sure I’m getting them too. It’s important to have a good smelling, well-cured egg. I’m using a combo of ¾ orange Fire Brine and ¼ red Fire Brine. It gives the eggs a glowing orange/red look. And, then I add Pautzke Nectar after I cut them. The Nectar (I use red) brightens them up more and soaks into the eggs. I want them big and plump. I’m adding Nectar after my baits are cut and in the tub. It rejuvenates the baits, makes them milk good and become big and juicy. I also put anise oil in my squirt bottle that the Nectar is in. Anglers are permitted 6 fish per day, per person: 2 adults per day (either kings or Coho), and four jacks. Editor’s Note: Pautzke pro Bob Kratzer operates Anglers Guide Service. 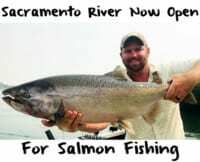 For info on his Cowlitz River trips please visit http://www.anglersguideservice.com/.